Last year, Noelle and I talked about the emergence of sherry in San Francisco, helped along by Michelin-starred Range in the Mission. Personally, I've been rooting for sherry for a few years now, and I'm excited that it's now taking root in a big way. I recently had the great good fortune to sample a flight of sherries from Tío Pepe, one of the sherry Spain's sherry bodegas. I was so blown away by the passion of these guys, as well as their lovely sherries, that I wanted to share some of what I learned here. This post is meant to be a basic sherry primer for anyone interested in sherry but put off by the unfamiliarity of it. I'll very briefly cover how sherry is made and introduce you to the seven expressions of sherry: manzanilla, fino, amontillado, palo cortado, oloroso, cream, and Pedro Ximénez. Finally, I'll cover the best way to enjoy these sherries. For starters, what is sherry? Sherry is a wine from the Jerez region of Spain. In French, Jerez becomes Xérès. In English we call wines from Jerez (Xérès) sherries. 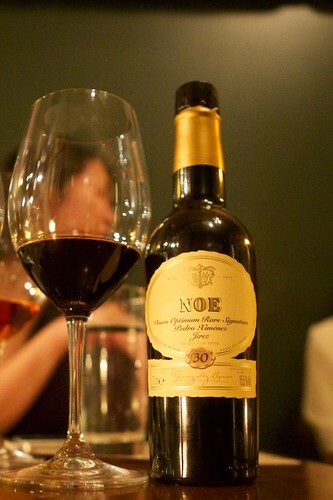 Sherry, like port, is a fortified wine, meaning it's ABV is between 15.5-22%. Unlike port, though, sherry is oxidized, giving sherry a totally unique flavor. Additionally, sherry undergoes a complicated and continuous system of blending and aging in a variety of barrels. Different styles of sherry are produced by aging the sherry in different ways, not by varying the grape. In fact, all sherries come from one of three varietals of white grapes, even those deep red sherries that you'll see at the bottom of this post. The sherry you see below is called "Fino en rama." Let's look at the "fino" part first. Finos have a pale yellow color and crisp, acidic flavor almost like a verjus (the juice of unripened grapes, basically a less sweet, more acidic grape juice). 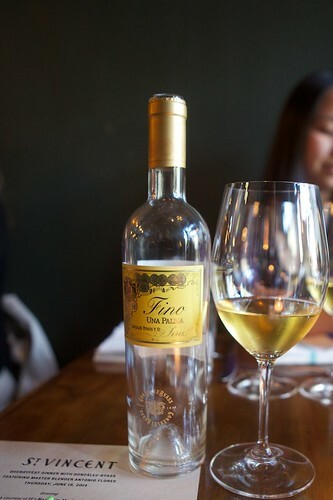 Fino's flavor comes from flor––a yeasty foam that forms on the surface of the wine while it's made. 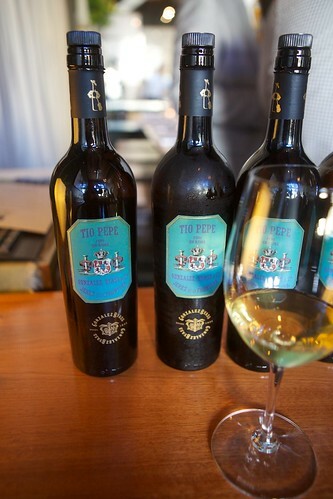 "En rama" means that this fino came straight from the barrel, a means of preserving the freshness of this delicate wine. Finos are similar to manzanilla sherries, but manzanillas comes from one specific seaside town in Spain and, as a result, have a slight brine to them. Another fino, the wine below has been aged for six years, but the yeast is still active, giving the fino a bitterness to complement its freshness. If one were to take a fino, add more brandy to bring the alcohol content up, and then age it in another series of barrels, you'd get an "amontillado." After the brandy is added and the wine is put into new barrels, it's no longer protected by the flor, the foam of yeasts that usually protects the wine from oxidizing. As a result of the oxidization, the wine takes on a pinkish hue and develops more nutty flavors. Many producers add some sweeter sherry to their amontillado, but you can fine some dry amontillados if you look for them and ask at your local wine store. 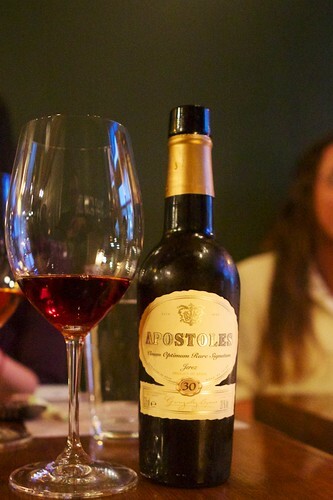 Now, if you were to age your amontillado for a very long time, the wine would take on special characteristics. Aged amontillado is called "palo cortado." Palo cortado is a unique sherry because it's like a weird hybrid of an amontillado and an oloroso. What's an oloroso, you ask? Oloroso sherries are aged quite awhile, and they are exposed to more oxygen than other dry sherries. As a result, they're nuttier and redder than other dry sherries. Olorosos use pressed juice and more brandy, making them thicker and richer than sherries that used more delicate juice and less brandy. 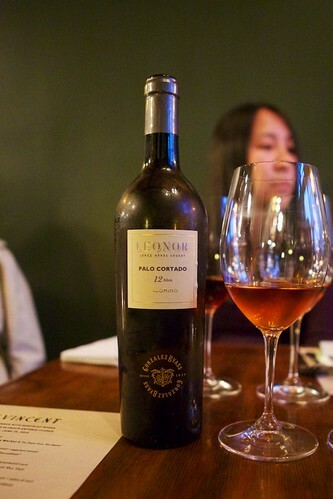 So a palo cortado is dry and delicate like an amontillado, but thicker and richer like a dry oloroso. The wine below is also a palo cortado, only much older than the wine above. You can clearly see how the aging process adds color to the wine. What you can't see is how much sweeter (but not too sweet, actually) and richer this wine is. These wine start tasting fruitier, especially raisiny. 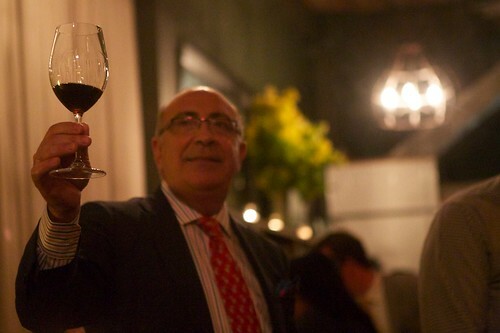 There may also be hints of orgeat and orange flower water leftover from the more delicate stages of the palo cortado. The folks at Tío Pepe have a slightly more poetic way of describing palo cortado. 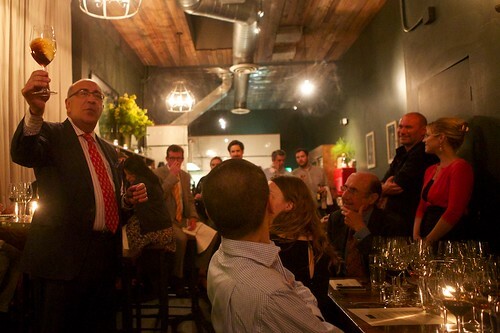 "What is palo cortado? Palo cortado is the wind in the trees. Palo cortado is the sun in the sky. Palo cortado is the wave in the ocean. Palo cortado is life." Finally, let's look at Pedro Ximénez. It's rare to find this on its own in the United States, so if you see it on a menu it may be worth a shot––but skip dessert because this wine is as thick as molasses and ten times as sweet. You only need a small amount, because each drop packs the flavor of figs, dates, and jam. It's very delicious, but if you overdo it you'll end up with a wicked headache. Take a look at the pictures below and you'll get a sense of the viscosity of Pedro Ximénez. There's one last type of sherry that you'll see the store more than any other: cream sherry. Cream sherry was created for the British export market. Essentially, it's just oloroso sherry sweetened with Pedro Ximenéz. There's no regulation on just how much PX the different bodegas (sherry-making houses) use, so some cream sherries will be painfully sweet while others will be more mild. I hope that this post provided a reasonably clear introduction to the sometimes daunting world of sherry. I encourage anyone reading this to hit up a local wine store and try a nice sherry. Manzanilla, fino, amontillado, and palo cortado sherries (as well as dry olorosos, if you can find them) should be served chilled and, like any white wine, finished within a two or three days. Manzanillas are so delicate, though, that you really want to finish them within two days. Serve these in a wine-sized pour in a white wine glass. These four sherries also pair well with food––especially seafood or fresh, crisp greens. Oloroso, high-quality cream, and PX sherries are all fantastic dessert wines. Remember, for PX, and some of the sweeter creams, you only need half an ounce to an ounce. PX is also a nice addition to vanilla ice cream, as long as you're not using a $300 bottle! We continue to receive gushing feedback from our guests about this place. Their manager and his team really went above and beyond to ensure a seamless, special and magical event.